Sales tax for newsletter subscriptions… the “Yang Gang” insurgency in presidential politics… a low estimation of Arkansans’ intelligence… and more! Never have so many people perceived so little benefit from so large a tax cut. Only 17% of respondents to an NBC News/Wall Street Journal poll believe their income tax burden fell as a result of the tax law passed at the end of 2017. Even among “core Trump supporters,” only 36% believe they’re better off. The reality is that 80% of filers have a lower liability under the new law, according to the latest numbers from the nonpartisan Tax Policy Center. Meanwhile, with only six days to go before Tax Day, the refund picture is improving. Sort of. The IRS has just updated the numbers through March 29. The average refund now clocks in at $2,873 — only $20 less than last year. That said, the number of taxpayers collecting a refund has fallen by 1.6 million. Hmmm… The total number of filers was 141.2 million in 2015, the most recent figures we can readily dig up. And presumably most of the people who haven’t filed yet are the ones who know they won’t be getting a refund anyway. That 1.6 million is the proverbial drop in the bucket. But it’s also undeniable that perceptions aren’t matching up with reality. What gives? Between the way the GOP wrote the law and the way the IRS implemented the law, the whole thing’s been a hash from start to finish. As we said in February, the benefits don’t feel tangible or visible — in contrast with the Bush 43 tax cuts, when Uncle Sam sent a check for hundreds of dollars to most American adults. Back to the Tax Policy Center numbers: For the 60% of Americans at the lower end of the income spectrum, the total benefit is less than $1,000. 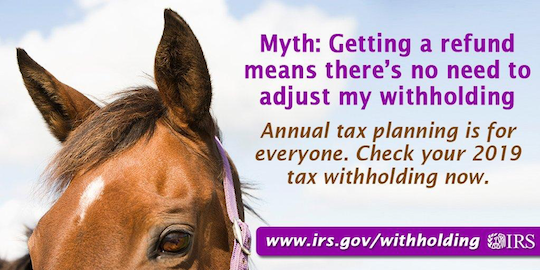 And for the many people within that 60% who collect W-2 income, the $1,000 got spread across 26 paychecks a year. It was hardly noticeable. It was even less noticeable because the lower withholding for income taxes took effect in early 2018 — at the same time many wage earners were hit with higher withholding for health insurance. And even if their take-home pay rose a bit, the extra few bucks got eaten up by rising gasoline prices. They jumped an average 50 cents a gallon from January–May. Oh well… It’s all a moot point in another seven years, when the individual tax cuts expire. Assuming Congress doesn’t rewrite the law before then. Which seems likely. [Ed. note: Even if you’ve already filed this year, you might want to file an amended return after you see the Rich Dad 2019 Tax Guide — prepared by Robert Kiyosaki and his crack team of tax experts. It’s packed with 91 tips and tricks to maximize your refund (or minimize what you owe). The “paycheck loophole” on Page 17 alone could be worth $13,000 or more. With the U.S.-China trade war still unresolved, the Trump administration plans to levy tariffs on $11 billion in imports from the European Union, including wine and cheese. With that, the Dow is down nearly three-quarters of a percent at last check, to 26,155. The S&P 500 and the Nasdaq are registering more modest losses. Gold has once again pushed above $1,300. Crude is down but still over $64 a barrel. But a U.S. recession is still a ways off, judging by one of the more reliable recession indicators out there. The Philadelphia Fed State Coincident Index crunches four employment figures from all 50 states, generating an overall number that ranges between plus 100 and minus 100. Numbers below plus 50 have marked the onset of every recession over the last 40 years. The number for February comes in at 76 — up from 60 the month before. It’s the weakest two-month stretch since the spring of 2016, but nothing to get too concerned about. That said, there are signs of job-market trouble in three states — Minnesota, Kansas and Montana. Small-business owners have settled into a “new normal” as winter turns to spring in 2019. 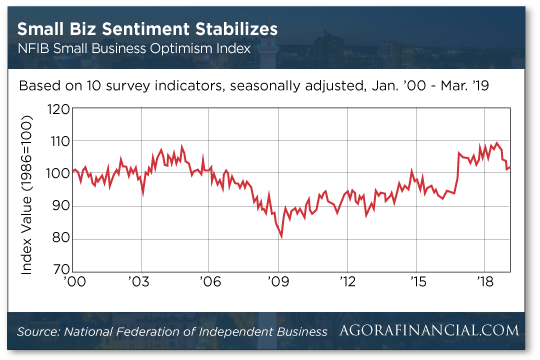 The monthly Optimism Index from the National Federation of Independent Business registers 101.8 for March — nearly unchanged from February. The number tumbled late last year along with the stock market and tumbled further in January — which the NFIB attributes to the partial government shutdown. One point of concern in the survey is that inventories appear to be too large and owners are in no hurry to add to them. The often-revealing “single most important problem” part of the survey looks nearly identical to a year ago — with 21% of owners citing “quality of labor.” In other words, good help is hard to find. Taxes and regulations are tied for second place at 15%. Speaking of “cautious optimism,” that’s still the vibe about the stock market from this year’s CMT Symposium in New York. “I’ve been coming to this conference for the better part of a decade now,” says our resident quant Jonas Elmerraji. It’s a gathering of 300 or so traders, portfolio managers, analysts and so on, all of them versed in technical analysis. The sentiment right now? “These folks think that the market is heading higher, even if there are a few caution flags to be aware of. The day might not be far off when a cannabis business can actually get a bank account. Because banks are federally regulated and because marijuana remains illegal at the federal level, pot remains a largely all-cash business — even where it’s legal on the state level. But two weeks ago, the House Financial Services Committee approved a marijuana banking bill. “If the bill ultimately makes it into law, it could open new, cheaper funding to an industry that’s eager for growth capital,” Ray tells us. Prospects for passage in the House appear good: The bill has 152 co-sponsors, 12 of them Republicans. The 5: As we’ve mentioned periodically, the Supreme Court issued a ruling last year that opened the way for cash-hungry state governments to start collecting sales taxes from companies that do business online. As it happens, Agora Financial saw the writing on the wall a while back — and began adding state sales tax in 2017. If our competitors aren’t doing it yet, rest assured they will. On the subject of Jim Rickards’ 2020 election outlook, “Jim did not mention Andrew Yang as a possible dark horse in the Democrats’ presidential field,” a reader writes. The 5: Ah, a prospective member of the “Yang Gang” speaks up. We’ll have more to say about Yang and his “unconventional” ideas either later this week or early next. “Your cauliflower rice story brought to mind an anecdote about Arkansas, my neighbor to the south,” a reader writes. “I’m now retired, but I worked in the property and casualty insurance industry, which is regulated at the state level. The company I worked for wanted to introduce a homeowners’ rating plan in Arkansas that we had in place in most other states, but their insurance department was balking. “I got on the phone with their regulators and tried to explain how this particular way of rating was more intuitive, better allocated premiums in relation to losses (i.e., was more fair) and had nothing hidden or tricky about it. The 5: Who knew the collective self-esteem in the Razorback State was so low? P.S. Have you heard about the tax loopholes the IRS might be looking to close? Like Section 1031? Or the obscure tax form Schedule R? Or retirement form 8880? Whether you have or not… you’ll want to check this out right away.